Fungicide containing yeast extract extract hydrolysate from Saccharomyces cerevisiae . Keyplex 350 OR will elicit production of defensive proteins in certain plants. 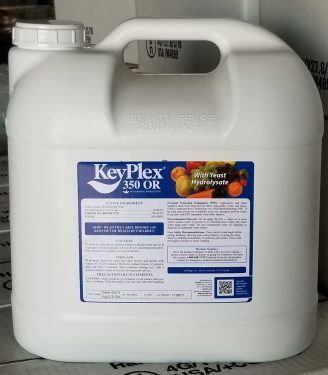 Keylex 350 OR will aid in the prevention of certain plant diseases such as post-bloom fruit drop and greasy spot diseases of citrus, and bacterial leaf spot disease of tomatoes. Keyplex 350 OR is registered for use in most states. See full list here (bottom of page).